Art Hotel Amsterdam (3-stars) is in the city quarter Westerpark, 10 minutes by public transport from Amsterdam city centre. The hotel is on the border of Spaarndammerbuurt which is renowned for the world famous Amsterdam School-building ‘The Ship’, making it a wonderful area with much to discover. The hotel is easily accessible by car or public transport (bus 48 or 22).Art Hotel Amsterdam has 130 modern hotel rooms, all with free WIFI internet. In the public areas is an art gallery of the famous Dutch artist Herman Brood. Also in the rooms you will find art above your bed.The Art Brasserie is open daily for a la carte breakfast, coffee to-go, lunch, drinks and dinner. Next to The Art Brasserie is restaurant The Gallery, also used as breakfast restaurant. Adjacent there is an outside terrace with bar and a public open air swimming pool. The hotel is suitable for business as well as private use. Next to Art Hotel Amsterdam*** is the 4 star Art Hotel Amsterdam****. The WestCord Art Hotel Amsterdam and its staff have gained a lot of experience with arranging meetings, conferences, trainings and all sorts of events. Offering conference facilities including 6 meeting rooms the hotel has been used as a conference hotel in Amsterdam on a regular basis. 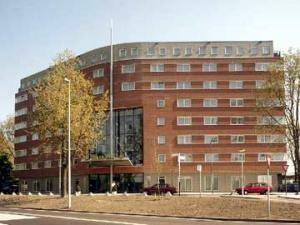 Please also have a look at the other conference hotels in Amsterdam which we are proud to present to you.